Gaia, the Greek Goddess of the Earth, is for many pagans today the spiritual embodiment of our planet. 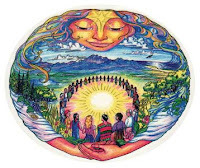 And because Earth Day - a worldwide event intended to inspire appreciation for the Earth and the environment - is on April 22, I have chosen Gaia as The Bad Witch's Goddess of the Week. Gaia was worshipped widely in ancient Greece. In the Roman pantheon, she was called Terra - which is also a name often used for the Earth itself. She was seen as a mother goddess and was often worshipped in enclosed spaces such as caves, symbolic of the womb, or out in nature in groves of trees. Gaia, the name for the Earth personified, is often also used by environmentalists when they talk of the planet as behaving like a living organism, capable of fighting back against things that harm her. And, in fighting back against such things as vanishing rainforests and pollution, Gaia is seen as punishing us, her thoughtless children, for the harm they have caused. "If we fail to take our planet seriously, we will be like children who take their homes for granted... we will not notice as we enjoy our daily lives that the cost of our neglect could soon cause the greatest tragedy in the memory of humankind. The Earth, in its but not our interests, may be forced to move to a hot epoch, one where it can survive although in a diminished and less habitable state. If, as is likely, this happens, we will have been the cause." Whether you are a pagan or an environmentalist, or both, Earth Day is the perfect time to honour Gaia in a practical way by getting involved in a project to help save the planet or simply by trying to reduce your own carbon footprint. The Vanishing Face of Gaia: A Final Warning by James Lovelock is available from Amazon for £11.99. The Mother Gaia Egg Window Sticker in the picture top right is available from the online store Pagan Magic for £2.99.